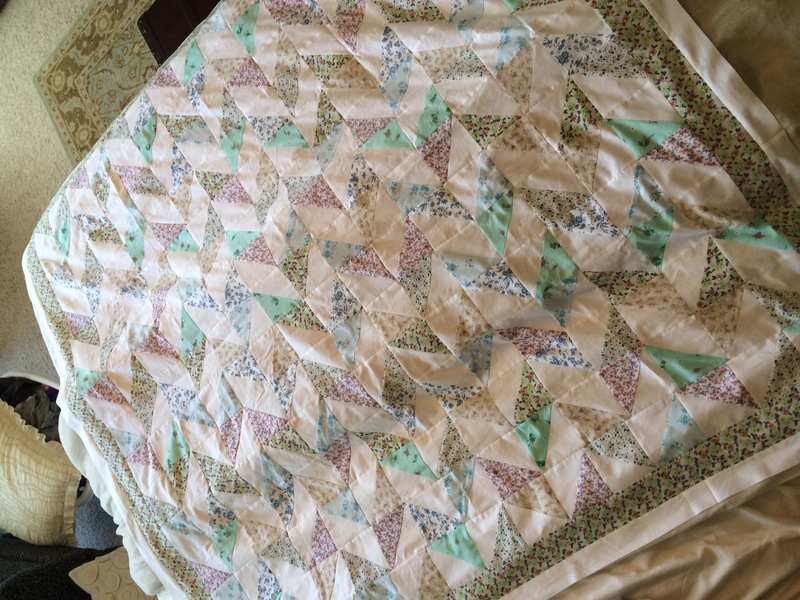 Low-Volume Quilt Defined: This is a quilt using very light, muted fabrics featuring mostly whites or light-colored prints. This past weekend little Wrenn took a 3.5-hour morning nap, and Mr. Right was at work, which meant I had some rare, uninterrupted quilting time! 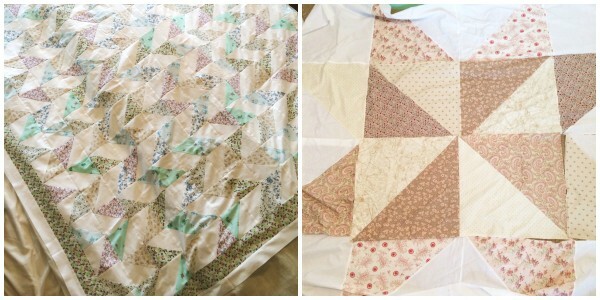 I’ve got two low-volume quilts going right now, and I am in love with the look of both. I love working with brightly colored fabrics, but there’s something so soothing and romantic about a quilt that features light fabrics without looking childish. I think it’s the opposite – it can be so sophisticated – not to mention they look great in any room. with gorgeous vintage fabrics I purchased from a lady who was moving to a nursing home and needed to find a good home for her 50-year stash (I’m that good home). I want this quilt to be big and snuggly, so right now it’s 65 x 65 inches, but I’m considering adding another couple of borders to make it even bigger. My only concern is adding too much “weight” to this low-volume quilt. 2. I have a love-hate relationship with the star quilt on the right. 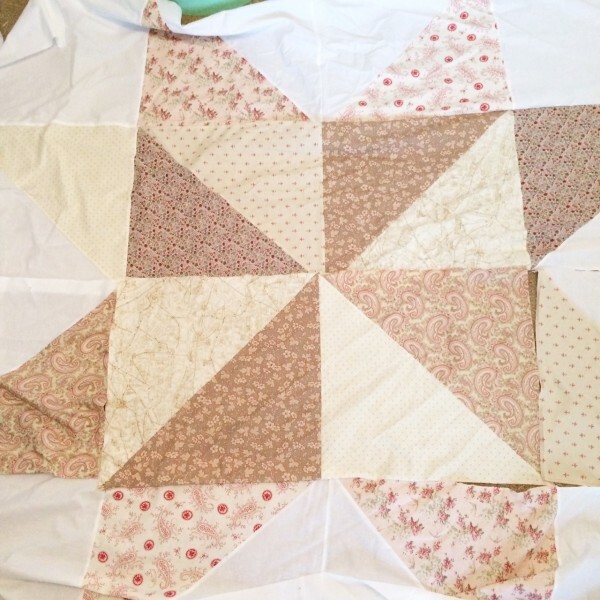 I used this tutorial, and my hope had been that this quilt was going to be a fast, easy first quilt after little Wrenn was born last summer. 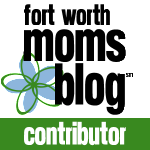 At the time, I was sleep-deprived and overwhelmed with my new role as a mother, and wondering how I would ever manage to do anything for myself in the midst of our new normal, when Mr. Right gave me the “night off” and told me to go do something fun. Bless him. “Some of your squares are upside down,” my oh-so practical husband told me, matter-of-factly. I almost shot him. I blame the hormones. And the sleep deprivation. But I was so mad at that moment that I wadded the stupid quilt up and tossed it in my sewing room. Once or twice over the next few months I got the nerve to pull out the quilt and look at it, to see if my mess-up was too noticeable. It was. And I just couldn’t stand to pull everything apart to make the fix (I had flipped two of the inner squares upside down, which meant taking the whole thing apart). 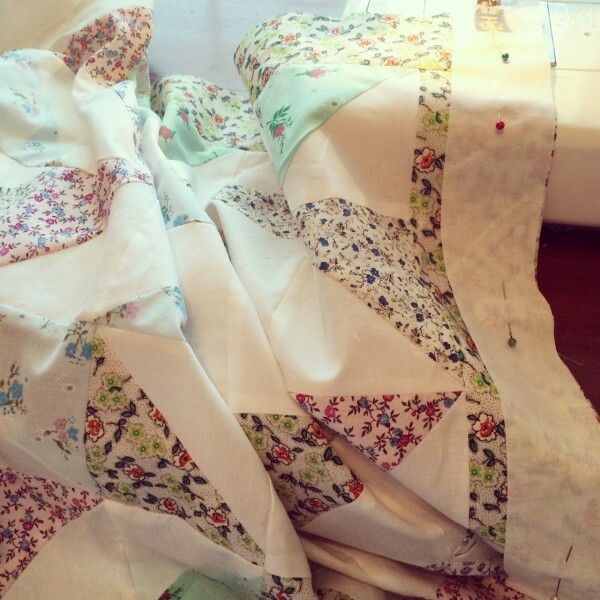 But this past Saturday… I was finally able to bring myself to pull out the seam ripper and go to work fixing the quilt. It only took me about an hour, and was actually pretty simple. Oh, what a difference a year and some good nights of sleep can do to one’s outlook on quilting. I do plan on selling this quilt in my shop, so keep an eye out for it in the next few weeks. I still need to pick out the perfect backing fabric and get her quilted. But it feels good to have this quilt top DONE. Whew. 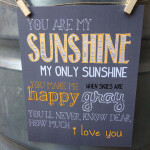 For more prints, visit Texas Lovely on Etsy.